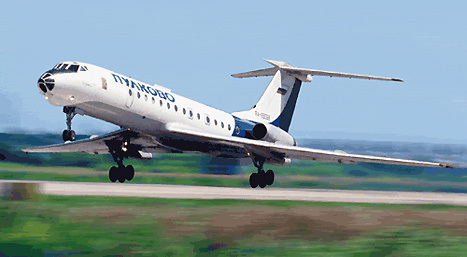 Formerly known as Leningrad Airport, Pulkovo Airport has been serving the city of St. Petersburg since way back in 1932. Pulkovo comprises of two terminals, Pulkovo Domestic Airport (aka Terminal I), around 18km south of the city centre, and the slightly nearer Pulkovo International Airport (aka Terminal II), which is 17km south. The recently refurbished International Terminal is everything you would expect from a modern, professional airport, and fears of the ground crew swigging vodka inbetween landings are unfounded... Unless of course it's really cold, in which case a little imbibing is essential, 'for medicinal purposes'. Getting to town from the airport by public transport can be a little challenging for newcomers to Russia, but it's worth avoiding the temptation of a taxi. Licensed taxis in Russia are ridiculously overpriced (see our section on the Citizen Taxi) and the fare could easily be 50 Euros into town. If you can't resist the temptation of door-to-door service, be sure to negotiate a price first. The braver (viz. poorer!) amongst you should take a bus to Moskovskaya Metro Station, from where you should be able to continue your journey easily enough. For the price of a couple of turnips, buses N113, N213 and mini-buses K13 and T113 will get you there. Minibuses K3 and K213 also go to Moskovskaya before heading onto Sennaya Square in town, although they are less frequent. Facilities-wise you should find everything you need in Pulkovo - if not everything you ever desired. Bureaux de change, ATMs, toilets and a restaurant and 24hr cafe mean that you won't be left penniless and hungry.